Background: Rasashastra is a branch which deals with the pharmaceutics of Rasaoushadhis. Bhasmas are one among such Rasaoushadhis which are known for their low doses and fast action. A verse from Rasaratnasamuchchaya says that the bhasma prepared by using Mercury as media is of best quality. Materials and Methods: Following this principle, Yashadabhasma (Zinc calx) was prepared by subjecting it to Samanya shodhana (general purification method for all metals), Vishesha shodhana (specific putification method for Zinc), Jarana (roasting) and Marana (incineration) with Parada(Mercury) as a media under Gajaputa (classical heating system with 1000 cowdung cakes). 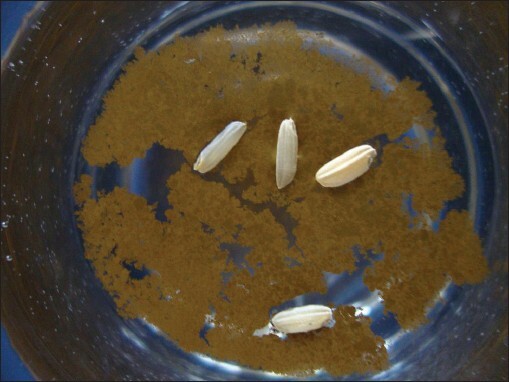 Results and Conclusion: Yellow colored Yashadabhasma which passed all the classical bhasmaparikshas (tests for properly prepared calx) was obtained after two putas. The bhasma did not pass Nishchandratva(free from shining particles) test after 1 stputa but was passed after giving it 2 ndputa. Rasaoushadhis have unique place in Ayurvedic therapeutics because of their qualities like Alpamatropayogitvat (used in less dose), Arucher-aprasangata (no incidence of bad taste) and Kshipramarogayadayitvat (fast acting). Rasashastrais a branch which deals with pharmaceutical technology of such Rasaoushadhiswhich include various Samskara(processing) like Shodhana (purification), Jarana (roasting), Marana (incineration), etc.Yashadabhasma (Zinc calx) has to be prepared accordingly, without any deviation from the classical preparation method in order to assure its safety and efficacy and also to get the desired effects in the diseases in which it is indicated like Prameha (Diabetes), Pandu (anemia), Vatavyadhi (neuro-muscular disorders) and Netravikaras (eye disorders), which are routinely seen in our clinical practice. In the present study, Yashada (Zinc) was subjected to Samanya Shodhana (general purification method for all metals), Vishesha Shodhana (specific purification method for Zinc) and Jarana (roasting) as per Rasatarangini. Yashada Marana (incineration) was done as per Rasachandamshu. Yellow colored Yashadabhasma was obtained after two Gajaputa (classical heating system with 1000 cowdung cakes) which passed all the classical bhasma parikshas (tests for properly prepared calx) i.e. Rekhapurnata (the bhasma should enter the furrows of finger), Varitara (the bhasma should float on the still water surface), Unama (the bhasma should float even after rice grains are placed over it on the water surface), Nirdhuma (the prepared bhasma should not emit any fumes when exposed to fire), Niswadu (the bhasma should not possess any taste), Nishchandrata (the bhasma should not contain any residual shining particles), Apunarbhava (the bhasma should not regain its initial metallic luster) and Niruttha (the bhasma when treated with Silver coin should not increase the weight of Silver coin). Yashada (Zinc), Parada (Mercury) and Gandhaka (Sulphur) were the major raw materials used in this study. They were collected from the department of Rasashastra and Bhaishajya kalpana according to the Grahya Lakshnas (desired qualities) mentioned in the classics and also depending upon the % of purity [Table 1]. Kanji (Sour gruel), Takra (Butter milk), KulatthaKwatha (decoction of Dolichusbiflorus) prepared as per Rasayanasara, Bhavaprakasha and BhavaprakashaNighantu,  respectively; Gomutra (cow's urine) and Tilataila (oil of Sesamumindicum) procured from the K. L. E. Ayurveda Pharmacy, Belagavi, Karnataka were used for samanyashodhana (general purification) of Yashada (Zinc). Churnodaka (lime water) prepared as per Rasatarangini was used for vishesha shodhana (Specific purification) of Yashada and it was prepared freshly in the department. Apamarga panchanga (Achyranthesaspera whole plant) churna (coarse powder) was used for the Jarana (roasting) of Yashada. Apamarga was procured from the herbal garden, Shri B. M. K. Ayurveda Mahavidyalaya, Shahapur, Belagavi. Fresh cow's milk, procured from the local cow shed was used for Gandhaka (S) Shodhana (purification). Lime stone, Paste of Allium sativum Linn and Rock salt were used for samanya shodhana (general purification) of Parada (mercury). Lime stone was procured from a kiln in Belagavi. Rasona and saindhava were purchased from the market and got authenticated from the subject experts. Ghritakumari swarasa (fresh juice of Aloevera Tourm) and Nimbuswarasa (fresh juice of Citruslimon Linn) were used for Bhavana (triturating) during Marana (Incineration). Kumari was procured from the herbal garden Shri B. M. K. Ayurveda Mahavidyalya and Nimbu from the local market. Pithara yantra (special instrument designed for the Shodhana of Putilohas) was used for shodhana of Yashada. A cement block with whole at the centre was used to cover the mouth of steel vessel (2.5 lit capacities). Kurmaputa (indirect heating method to melt the Sulphur) was used for Gandhaka shodhana. Khalva Yantra (Mortar and pestle) was used for Parada shodhana and for bhavana during chakrika nirmana (pellet formation). Gajaputa was used for Bhasmikarana. Jarita Yashada was triturated with 1/4 th quantity of Shuddha Parada and Shuddha Gandhaka to form uniform mixture (Kajjali) and then Bhavana with Kumari Swarasa and Nimbu swarasa were given and when the mixture attained proper consistency, pellets were made and dried in the shade. They were then transferred to Sharava Samputa (sealed in earthen crucibles) and subjected to Gajaputa using 1000 cowdung cakes. Highest temperature noted was 1010°C which was maintained for one hour and the total duration of heat treatment was 11 hours [Graph 1]. After 1 stPuta, the bhasma obtained did not pass the Nishchandrata test. Hence, again the procedure was repeated and second Puta was given but this time with 700 cowdung cakes just to avoid excess of heat which may bring back the metal to its original state. Highest temperature noted was 870°C which was maintained for one hour and the total duration of heat treatment was 11 hours [Graph 2]. After second Puta the bhasma obtained passed all the tests. General purification of Yashada (Zinc) was carried out as per Rasatarangini where in the order of liquid media used for Dhalana is different from the conventional order and even the number of Dhalana in each liquid media is only 3 times whereas it is 7 times in the conventional method. At the end of general purification it was observed that the hard shining Zinc metal was converted into lusterless brittle material. Various observations during general purification are tabulated in [Table 2]. After the Vishesha shodhana, Yashada was converted into much more brittle state and grey colored powder was formed. Various observations during Vishesha shodhana are tabulated in [Table 3]. During Jarana, Apamarga panchanga churna, 10-15 g, was added into the liquefied Yashada initially and dhruda mardana (vigorous trituration) was done with an iron pestle. Once this Apamarga churna burnt completely, again 10-15 g of it was added and dhruda mardana was continued. Offensive grey smoke was evolving during Mardana which made it very difficult for continuing the process. But mardana was continued using the mask. After 70 minutes of continuous dhruda mardana the whole of Yashada was converted into black ash/powder form. 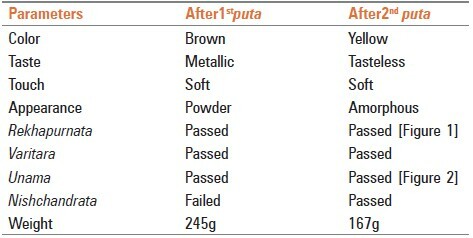 Weight loss during Jarana is tabulated in [Table 4]. 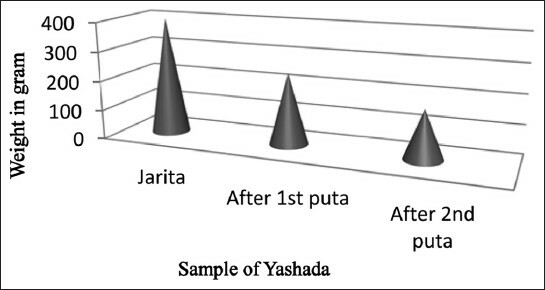 During Marana (incineration), 400g of Jarita Yashada powder was triturated with 100g of Shuddha Parada initially and then with 100g of Shuddha Gandhaka to form Kajjali. This mixture was then given Bhavana (triturating) with Kumari swarasa and Nimbu swarasa [Table 5] and total of 60 pellets were prepared weighing 650g and sealed in Sharava samputa. The reference says that bhasma will be obtained after the 1 stputa itself. But in our study, the bhasma obtained did not pass Nishchandrata test. 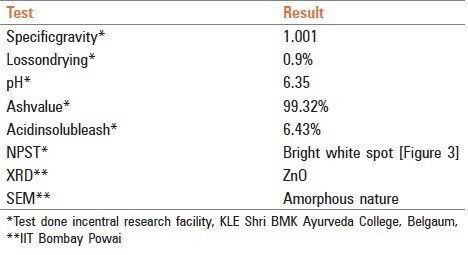 Hence, 2 ndputa was given taking the same proportion of ingredients [Table 6], which yielded bhasma passing all the tests [Figure 1],[Figure 2],[Figure 3], [Table 7]. The Bhasma was also subjected to various modern analyses like specific gravity, LOD, AIA, XRD, etc. and the results are tabulated in [Table 8]. Selection of raw material is the most important step in the pharmaceutics of Rasaushadhis. Authentic raw material with high quality assures of producing safe and efficacious finished product. In this regard, raw materials selected to prepare Yashadabhasma were tested chemically for their purity and used. Raw Yashada with zinc % of 94.42; Parada of 99.99% purity (MERCK Company) and Gandhaka with total sulphur of 99.62 were used. All the associated drugs like Kanji, Takra, etc. which were used at various stages, were prepared under surveillance. For general purification, Yashada was melted and poured in different media, i.e. Kanji, Takra, Kulatthakwatha, GomutraandTilataila (3 times each). The concept behind using particular media in this particular sequence is notable and this may probably be to remove the impurities from the drug, if any in a particular acidic or alkali media and also to reduce the hardness and particle size of the drug. Marked reduction in the particle size, i.e. ratio of small:large particles, was obtained by weight after the completion of Samanya and VisheshaShodhana in Churnodaka. When a metal is heated to melt and suddenly poured in cold liquid media, the immediate cooling leads to microscopic cracks which in turn lead to its brittleness. Before Marana, Yashada was subjected to an intermediate procedure called Jarana, where in the molten metal was roasted with Apamargapanchangachurna.Jarana may be compared with "polling" process in which refining of crude metal is done from its own oxide as impurity. It is a redox reaction with reduction being the dominant one. This was substantiated with the fact that very fine metallic shining particles were perceivable to the naked eye after Jarana and the weight of JaritaYashada was lesser than the original Yashada taken. During Marana, jaritaYashada (400 g) was triturated with ShuddhaParada (100 g) for 9 hours which resulted in the formation of dark black powder. This stage may be roughly compared to the Pishti formation with slight modification. As told in the reference of Rasachandamshu, the above step was further continued with the triturating of ShuddhaGandhaka (100 g) for 24 hours. Point to be noted here is we didn't use kajjali directly for triturating. Instead, mardana with Parada was done first and then with Gandhaka separately. Bhavana of Kumariswarasa and Nimbuswarasa was given separately and Chakrikas prepared. Maranawas carried out by the classical puta method by adopting Gajaputa. Pit measuring 63 cm(lΧbΧh) which is considered to be our institutional standard for Gajaputa was used.Total of 1000 cow dung cakes, each weighing 145 g with 19 cm diameter and 2 cm thickness at the center were used. The maximum temp range was 700-1000°C which was maintained for 3 hours. The weight of the chakrikas after the 1 stputa was 245 g with a decrease in weight of 405 g.The Bhasma obtained was not possessing Nishchandratva. Hence, 2 ndputa was planned with slight modification because it is documented that if the heat treatment is excess, then the metallic content increases in the bhasma. Hence, to avoid this cow dung cakes number was reduced to 700 from 1000. Rest of the procedure remained the same, i.e. bhasma after 1 stputa (200 g) was triturated with shuddhaParada (50 g) for 5 hours and then with shuddhaGandhaka (50 g) for 3 hours. Then bhavana with Kumariswarasa and Nimbuswarasa was given and total of 22 chakrikas weighing 340 g were subjected for 2 ndputa. During second puta the maximum temperature range was 700-900°C which was maintained for 3 hours. 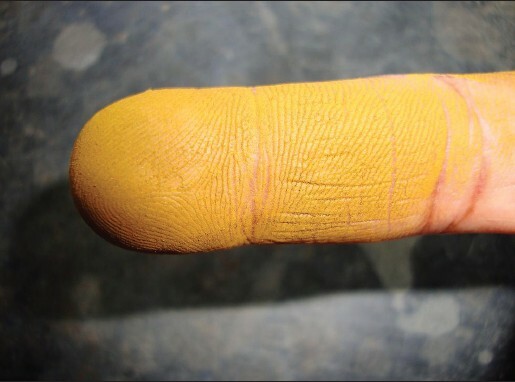 After 2 ndputa the bhasma passed Nishchandrata test and there was change in color of the bhasma from brown to yellow indicating the completion of Marana. 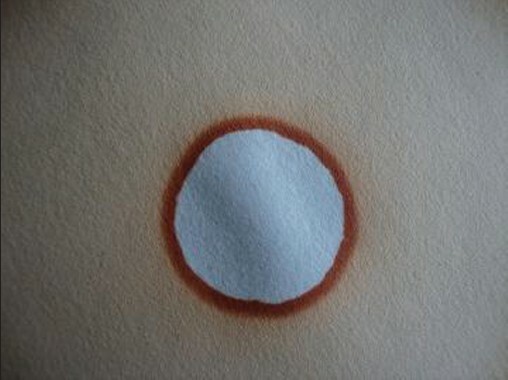 Its appearance was amorphous unlike powder form after 1 stputa. Final weight of bhasma obtained was 167 g with a loss of 173 g [Graph 3]. SamanyaShodhana by Dhalana in Kanji, Takra, Kulatthakwatha, Gomutra and Tilataila for 3 times in each media in the specified order, VisheshaShodhana by Dhalana in Churnodaka for 7 times, Jarana by using Apamargapanchangachurna and Marana by two puta are sufficient to obtain yellow colored Yashadabhasma which passed all the bhasmaparikshas. Authors are thankful to Dr. B. S. Prasad, Principal, KLE Shri B. M. Kankanwadi Ayurveda Mahavidyalaya, Shahapur, Belgaum, Karnataka for his help in carrying out the preliminary analysis in CRF (Central Research Facility). 1. Shyama SA, Rasayanasara. ShyamasundaraRasayanashala.Verse 55-60. Banaras: aribhashaPrakarana; 2005. p. 67-8. 2. Shri Bhavamishra . Bhavaprakasha. In: Mishra B, editor. Bhavaprakasha. 9th ed. Varanasi: Chaukhambha Sanskrit Samsthana; Purvakhanda, TakraVarga, Shloka 754-6, 1999. p.1-2. 3. Bhavamishra. Bhavaprakasha Nighantu. In: Srikantha Murthy KR, translator. Bhavaprakasha Nighantu, Krishnadas Academy; Purvakhanda: Verse 60-2, 1998. p. 372. 4. Sharma S. Rasatarangini. In: Shastri K, editor. Rasatarangini. 11th ed. Delhi: Motilal Banarasidas Publications; 2009. p. 280(Taranga 11/216-8). 5. Sharma S. Rasatarangini. In: Shastri K, editor. Rasatarangini. 11th ed. Delhi: Motilal Banarasidas Publications; 2009. p. 362(Taranga 15/4-6). 6. Sharma S. Rasatarangini. In: Shastri K, editor. Rasatarangini. 11th ed. Delhi: Motilal Banarasidas Publications; 2009. p. 475-6(Taranga 19/98-103). 7. Sharma S. Rasatarangini. In: Shastri K, editor. Rasatarangini. 11th ed. Delhi: Motilal Banarasidas Publications; 2009. p. 476-8 (Taranga19/104-17). 8. Shri Halasikara. Rasachandamshu. Hubli: AtreyaSadana; Purvakhanda; Sloka 587; 1850. p.144 .